How Did Your Solar Portfolio Perform This Quarter? 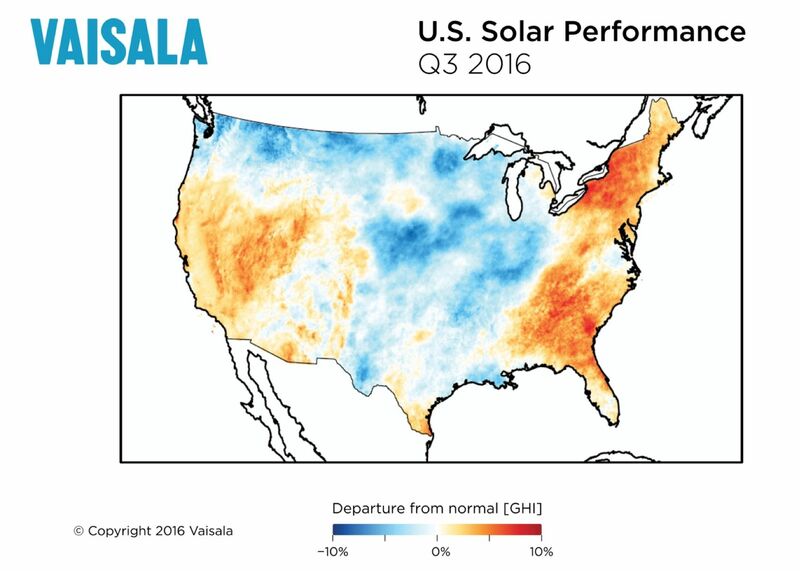 Our quarterly look at how weather is shaping solar power production in the U.S.
We're partnering with Vaisala, a company that monitors solar performance across the U.S., to give the solar industry a better understanding of how weather is impacting solar production across the country. The most recent set of maps evaluate the third quarter of 2016, which covers much of peak solar production season within the U.S.
After a disappointing 2015, many solar companies in North Carolina and Texas were hoping for a strong 2016 summer. 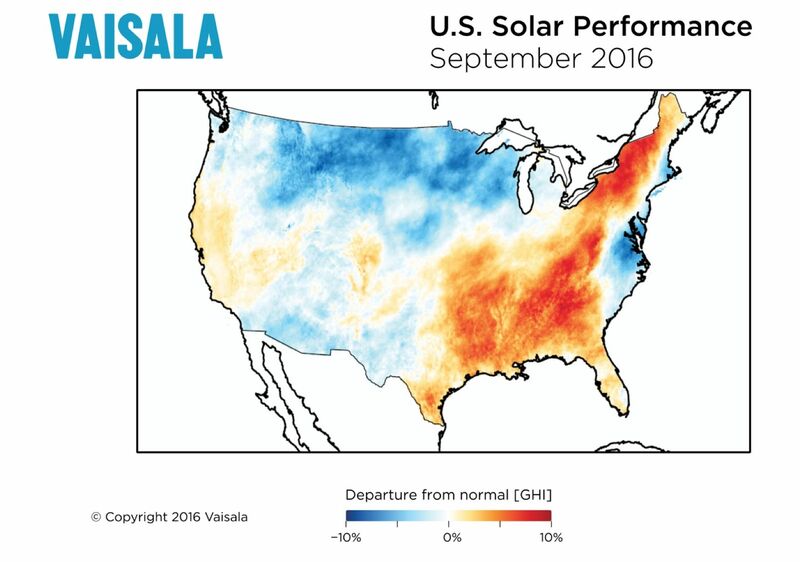 While July and August showed fairly high solar performance in North Carolina, the hurricane season in September brought enough clouds to bring the quarter below the long-term average for the state. Due to these conditions, plants in North Carolina could see an annual decrease in production of 1 percent or more, which is significant, considering the state has over 2.4 gigawatts of installed solar capacity. While Texas may not yet have many operating plants, companies prospecting in the region this summer should be aware that much of the season was below normal when assessing their observation campaigns. For the West Coast, the maps show large areas of below-par resource in a number of areas across California and the Southwest, which directly correlate with the sites of major wildfires throughout the region. One of the largest such areas surrounds the site of the Cedar fire in Kern County in Southern California; a sizable wildfire covering close to 30,000 acres. 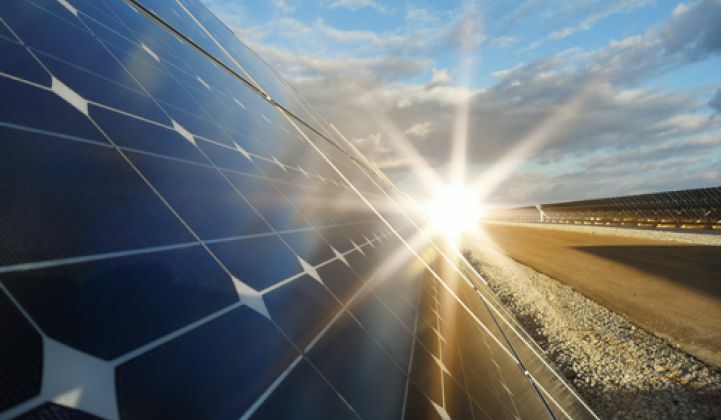 Kern County boasts an installed capacity of 4,881 megawatts of solar power. Vaisala estimates that a 1 percent loss in production in Kern County during a typical month of peak production would equate to over $940,000 in lost revenues for operators across the region. 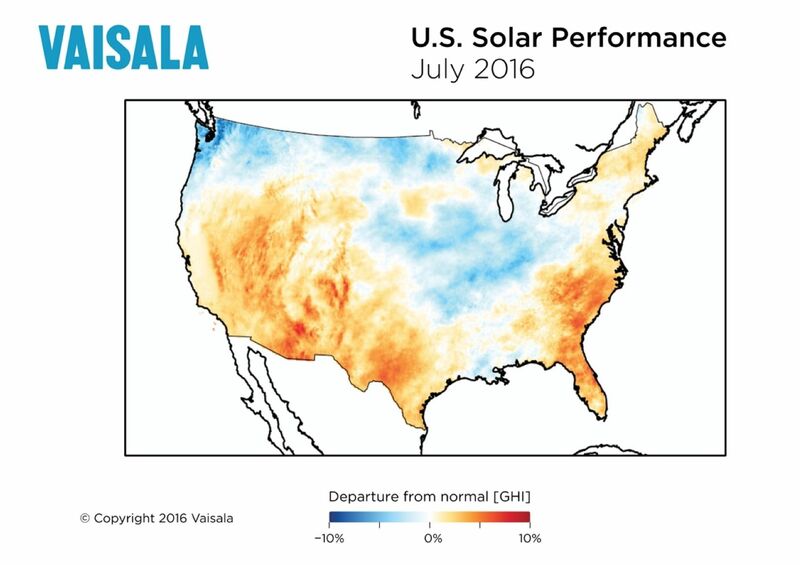 A similar impact is likely to have been felt by project operators across Southern California with a high volume of installed capacity, where major wildfires in July and August contributed to visible irradiance shortfalls on Vaisala’s monthly maps. 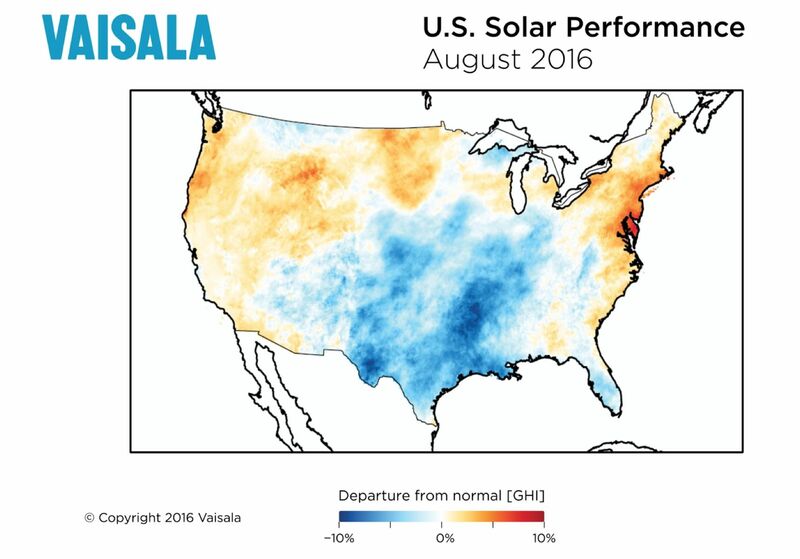 Heavier-than-normal rain, clouds and storms impacted solar performance in the central U.S. throughout the summer. Meanwhile, the Northeast was a relative bright spot throughout the quarter, only seeing some reduced production along the coast in September due to the weather impacts of a series of tropical storms and hurricanes. For more details, read the month-by-month summaries below to learn how specific weather conditions and anomalous patterns throughout July, August and September may have influenced solar production across your portfolio. Subtropical high pressure dominated the weather over the contiguous United States (CONUS), blanketing much of the country with unusually warm and sunny weather. Heavier rains fell along stalled weather fronts from the Central and Northern Plains to the Ohio Valley. The hot and dry weather associated with the high pressure system also contributed to the development of wildfires across the West, especially during the latter half of July. Nationally, July 2016 ranked as the 14th warmest July in the 1895-2016 record. The Residential Energy Demand Temperature Index (REDTI) for July 2016 ranked sixth highest in the 122-year record for July, due to above-normal temperatures which increased cooling demand in the heavily populated Northeast, Midwest, Southeast and South. Much of the West was drier than normal, and the dry weather was a factor in the development of numerous large wildfires across the region throughout the month. However, above-normal monsoon rainfall helped minimize the occurrence of wildfires in the Southwest. Rain from slow-moving cold fronts and tropical systems also made for a cloudier and wetter-than-normal month from the Southern Plains to the Great Lakes. Heightened Gulf of Mexico moisture across the eastern half of the CONUS combined with storm fronts resulted in above-normal August precipitation from the Southern Plains to Great Lakes, and the second-wettest August, nationwide, in the 1895-2016 record. One example of these record conditions was a tropical storm that hit Louisiana the week of August 14, dropping heavy, flooding rains before being absorbed into a cold front. Large areas of California and Nevada were drier and sunnier than normal for September, as was central and eastern CONUS, where weather patterns restricted typical seasonal rainfall. In contrast, the Interior West to Northern Plains and Southern Plains to Upper Midwest experienced above-normal rainfall and cloudy conditions. Moisture from the remnants of East Pacific tropical cyclones gave parts of the Southwest above-normal precipitation, and moisture from North Atlantic tropical cyclones resulted in a wetter-than-normal month along the coast from the Southeast to Mid-Atlantic states. Storms from the Atlantic Ocean including Tropical Depression 8 and Hurricanes Hermine and Julia brought increased storms and rainfall along the Atlantic and Gulf Coasts. On September 1, Hurricane Hermine came ashore in northern Florida, joining with an existing cold front to bring heavy rain to the coastal Southeastern states. Above-normal precipitation from fronts and tropical systems offset the dryness in the West and Central U.S., with the result being the 40th wettest September on record for the CONUS.